Flavor Text: Three thousand years had passed him by. He was eager to begin reclaiming what was rightfully his. When will High Priest keyword get some love?! Feels like his action ought to be a disrupt, to get a little more mileage out of that toughness. The action is voluntary so you get mileage out of it. He's not a bad blocker for Hastur, who is somewhat lacking in Combat prowess, or a budget Khopesh wielder I guess. Just nothing really fancy. I got him in a 40-card pack, so I only have one copy. And I usually don't include multiple copies of unique characters. But if I had three of him, I'd often build in 2. 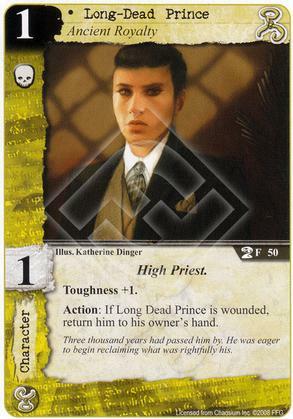 He's cheap and good at what he does, and he works especially well in a Twilight/Hastur deck that focuses on return-to-hand effects. I do find it wierd that after everything he must have experienced in those 3000 years, he can still go insane. I'd imagine he would be jaded by now!